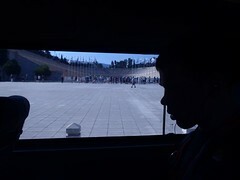 In Athens, Dad and I were supposed to do a Port Adventure that involved competing in games at the Panathenaic Stadium, but two days before the Pireaus port call we got a note that said our Port Adventure was cancelled due to not having enough people. Thus, we joined Mik and Mom on the Private Vehicle w/ Lift tour that was already booked with an itinerary to visit the Panathenaic Stadium as well as the Acropolis. The four hour tour ended up being just the right amount of time to enjoy both rather leisurely. Here the driver parked right in front for us to visit. Most of the bus tours also stopped here, as it is a good photo stop out in front. However, we also took the time to go inside the stadium. The cost was 3 Euros for adults, but Mik only had to pay the student price (1.5 Euros) and one companion got in free with him. The walkway around the track is rather flat, but it is a large step up onto the track. 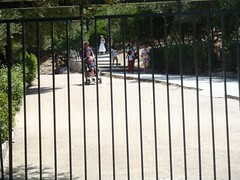 There appears to be a ramp in the front, but it is part of the gated off section. For us, it was easy to just lift Mik up onto the track. 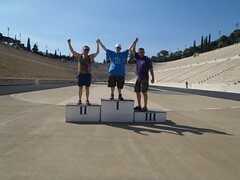 There you can run around the track, take pictures on a medal podium, and see tablets inscribed with the years and host cities of the modern Summer Olympics (they are in Greek and interestingly over the past century the spelling of Athens and London seems to have changed). For Olympic fans like us, it was cool to see the stadium for the first Modern Olympics in 1896 (it was also used for more ancient games), although it is annoying Dad did not show us the pamphlet that came with the tickets until we were back on the ship because we missed climbing up to the seat with the founder of the modern games on it. Mik would not have been able to go up there, but he would not let me climb up to the top at all because he did not want to wait for us (it was his tour Dad and I joined after all). However, if he had known there was something to see other than a different view he would have been fine with me going up there. 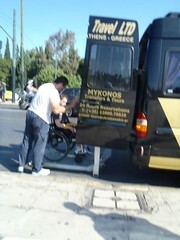 At the Acropolis, the driver drove right up to the ticket office area to drop us off. He could not stay parked there, so he parked the vehicle and came back up to wait for us to be done and then brought the vehicle back up to pick us up and return to the ship. When we started out tour we were warned that Mik might not be able to visit the Parthenon, as apparently it is pretty common for the elevator to not be operating. The driver checked for us before unloading and if it had not been working we would have gone to the Acropolis Museum instead. The path to the “elevator” (Dad called it more like a mine car) is where those climbing up and down exit. They only allow one person to go with, so Dad went with him. They both got to go in free. Mom and I could have got tickets and climbed up, but we thought we would likely end up taking longer to do the climbing and since it was Mik’s tour we did not want him to have to be waiting for us. 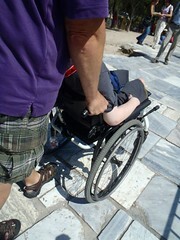 Mik was glad Dad and my tour was canceled because he would never have been able to do the Parthenon with Mom. The worst pathway was the area at the bottom around the ticket office and shops. Dad almost tipped Mik since his front wheel got stuck in a crack. Up at the Parthenon it was better, although it is old worn stone that can be slippery and not totally even. For an ancient ruin, though, it is pretty accessible other than it sounding like you may need luck for the elevator to be operating when you visit.